A Syrian militia led by Iran’s Islamic Revolutionary Guard Corps (IRGC) declared jihad on April 6 against US and allied forces in Syria. Since 2017, the US has twice come into direct contact with the group. The IRGC is likely to boost its military support to the group as it explores avenues to drive the US out of Syria. 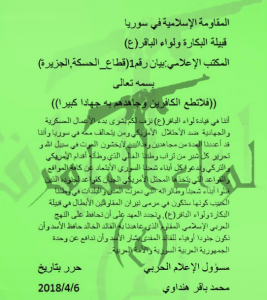 The Baqir Brigade (AKA Liwa al Baqir or Liwa al Imam al Baqir) published on its social media page a statement with the Baqqara Tribe, to which its members belong. 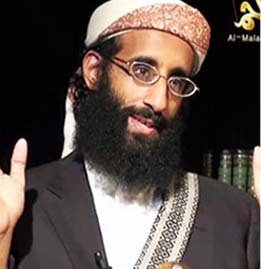 The tribe claims descent from the fifth Shiite Imam, Muḥammad al Baqir, the brigade’s namesake. The group’s open declaration features a militia logo that is a replication of the rising hand and AK-47 in the official logo of the IRGC and militias under its control. “Statement No. 1 (Al Hasakah-Al Jazirah Region)” started with the following Quranic verse: “So do not obey the disbelievers, and strive against them with the Quran a great striving” [Al Furqan, 52]. The militia’s suggestion of operating in Hasakah in al Jazira, deep into Syrian Kurdish territory in Deir Ezzor province in the northeast, is intended to indicate its reach as well as potential targets. 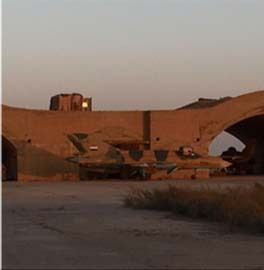 In late March, the Baqir Brigade had released a photo claiming to show US forces embedded with US-backed “separatist” forces, or the Kurdish-dominated Syrian Democratic Forces (SDF), inside Al Hasakah Central Prison to secure the landing of US helicopters. “For the Americans: Don’t think that al Assad’s men are unmindful of your presence,” the militia warned. The Baqir Brigade has repeated its threats against the US in response to a potential strike against Assad following chemical weapons use in the Damascene suburb of Douma. “If you want it to be a war, let it be a war and you will see a holocaust that will befall your bases in Syria and Iraq at first,” the militia commander Al Hajj Baqir reportedly said this week. The inclusion of Turkish forces in the statement is likely meant to boost support with Syrian Kurds rather than a signal of attacking Turkish troops, though that possibility should not be entirely dismissed. The Baqir Brigade’s members were the pro-Syrian regime fighters deployed to Afrin earlier to show support for Kurdish forces. While Tehran is unlikely to set its guns on Turkey, with which it and Russia are in a negotiations process, it has used the latest Turkish offensive into Afrin to improve relations with Syrian Kurds and try to peel them away from the US. It is clear, however, that the crux of the latest letter is directed toward the US. 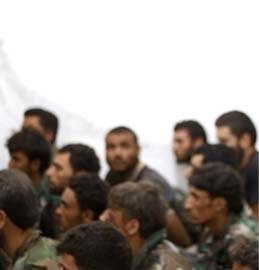 The Baqir Brigade, based in Aleppo province, is part of the Local Defense Forces (LDF) network, which is distinct from the IRGC-trained National Defense Forces (NDF) and is believed to answer more directly to the Guard Corps than the Syrian regime. The Baqir Brigade certainly advertises its affinity and close ties to the IRGC. 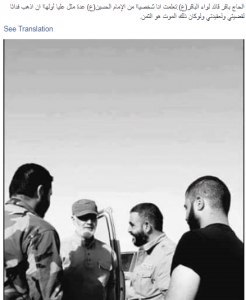 It has acknowledged receiving training and equipment and declares Supreme Leader Ali Khamenei as one of its “leaders.” The militia’s leaders have previously been photographed with Qods Force commander Qassem Soleimani. 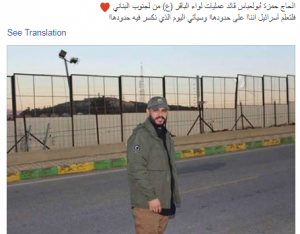 The Baqir Brigade has also vowed to fight the Iran’s arch-rival Israel, as its operations commander al Hajj Hamza, AKA Abu al Abbas, declared in December 2017 during a visit to the Israeli border in southern Lebanon. “Let Israel know that we are on its borders, and the day will come when we break its borders,” the caption of the photo read. 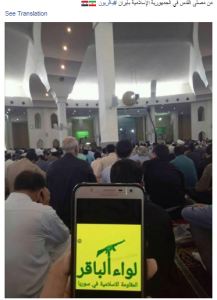 Those are open advertisements of answering to the Islamic Republic. The militia would not have declared jihad against the US without the approval of the IRGC. 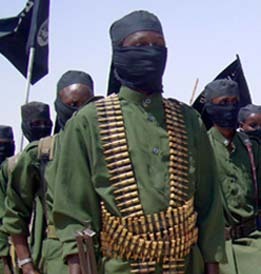 Last month, prior to the declaration of jihad, the militia publicized that its “mujahidin” and members of the Baqarra tribe went to Iran at the “expense” of Iran’s Supreme Leader Ayatollah Ali Khamenei to study at the Islamic Sharia College at Tehran University. In mid-March, the militia posted a photo showing its forces on an official visit to Iran. 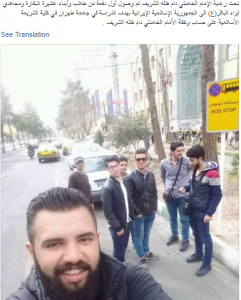 Baqir Brigade members in Iran to study at “the expense” of Khamenei. In February, the Baqir Brigade acknowledged fatalities during an assault in coordination with Russian Wagner private military contractors against US positions near Deir Ezzor city. The brigade also reported that two sons of Sheikh Nawwaf al Bashir, a prominent al Baqqara tribal leader, were killed in airstrikes by the US-led coalition and vowed vengeance. 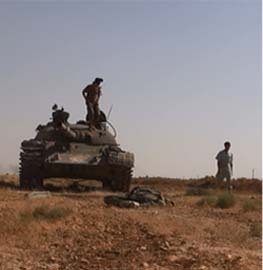 Baqir Brigade forces in the vicinity of the US base at At Tanf, June 2017. Last year, the Iranian-led militia came into contact with US forces in June 2017 as its members were trying to advance toward a US base by At Tanf, southern Syria. 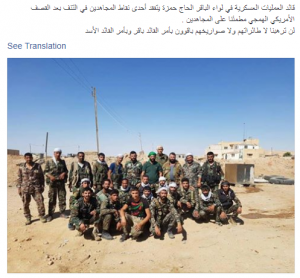 In a sign of defiance, the militia posted on the next day a photo showing its military operations commander al Hajj Hamza while visiting the group’s military positions after the US airstrikes. The Baqir Brigade’s latest declaration comes as the Islamic State’s so-called caliphate has collapsed in tatters, though the group is far from finished. Now, the pro-Syrian regime and US-backed forces are poised to compete more. “We hope big steps will be taken in order to liberate this area [east of the Euphrates River] and expel the occupying Americans,” said Ali Akbar Velayati, Khamenei’s top foreign policy adviser, during an official visit to Syria yesterday. Velayati reiterated a policy that has been previously declared by the Supreme Leader’s office. Through the Baqir Brigade, which has vowed revenge for the death of the two sons of al Baqqara tribal leader, the IRGC can say that it supports indigenous Syrian resistance against US presence. The IRGC knows well that it cannot directly confront US forces, as the February episode highlighted. The Guard Corps and its Lebanese branch, Hezbollah, however have years of experience in directing and fueling insurgencies and asymmetric warfare against conventionally-superior adversaries including the US and Israel. Observers should watch for Iranian-backed militia claims of attacks against US and US-backed forces in eastern Syria as well as those that bear Iranian signatures, such as explosively formed perpetrators (EFPs). Great article, well written and extremely informative. Any indicators that the IRGC-QF accompany these forces during their operations? Does any of their weaponry indicate advanced transfers? 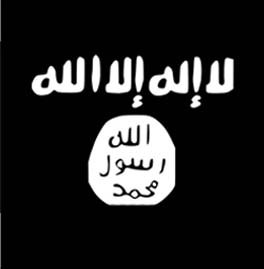 Claimed use of or images of EFPs, IRAMs, artillery/mortar pieces, or mil vehicles? We need to go after the tyrant butcher a$$ad. He needs to be eliminated. At a minimum, to end the nightmare going on in Syria will mandate the elimination of a$$ad. And that will be only the beginning of the end of the nightmare going on over there. He is nothing but a curse on even the concept of humanity. Why haven’t the Israelis done it, or even the Jordanians, or even the Saudis or Turks done it is beyond me. We all know it’s only a matter of time before America and Iran come face to face if we continue to stay in Iraq. Mr. Trump is right, It’s time to pull back. At least for now. Unfortunately, we are seeing the rebirth of the Persian Empire.